I have always been fascinated by the design of monuments. How do we choose to memorialized our heroes, our triumphs and our losses? 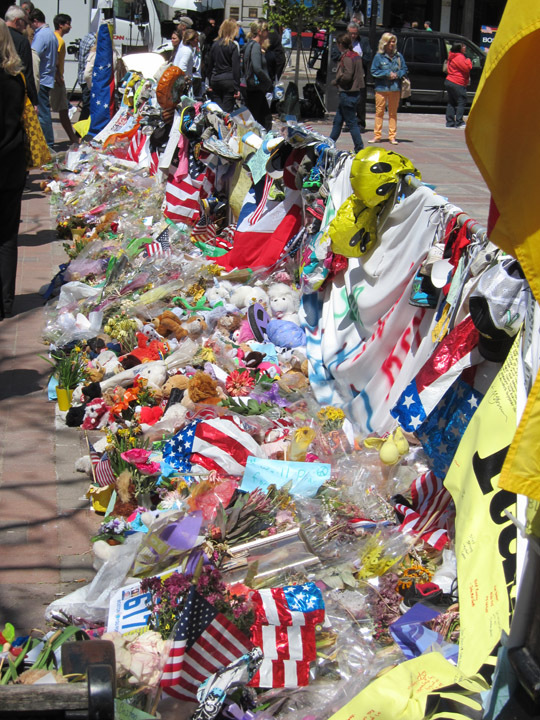 Having just returned from Normandy, I’m working on more posts specifically about this, but the home-made Marathon Bombing Memorial got me thinking about the immediacy of emotions following a tragedy. There is a collective sense of shock, fear, anger and sadness. With nearly instantaneous and complete news and social media coverage “from the ground”, we are glued to, involved in and react viscerally to these images. It’s no surprise then that people unconnected with tragedies want to reach out to comfort those affected or to offer their sympathy. Collective mourning helps us cope with having witnessed a bombing from across the street or from the safety of our homes and offices. 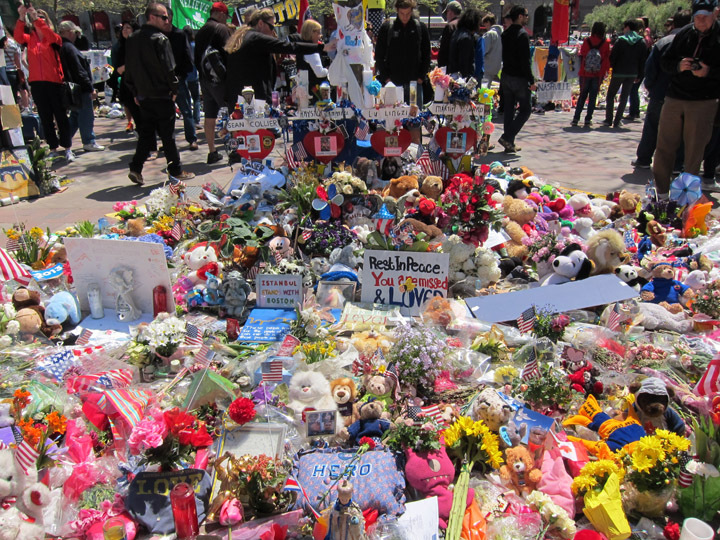 And so the cards, flowers, stuffed toys and mementos arrive. Each a small token of sympathy meant for the victims, for the senders and for us all. In some ways it reminds me of found object Outsider Art. But now instead of one artist selecting 400 special objects to incorporate into a whole, there are thousands of people each selecting one special object. The combination of all the shared value and sentiment makes for a powerful and spontaneous memorial. It is randomness and simplicity of make-shift memorials that I find so beautiful. 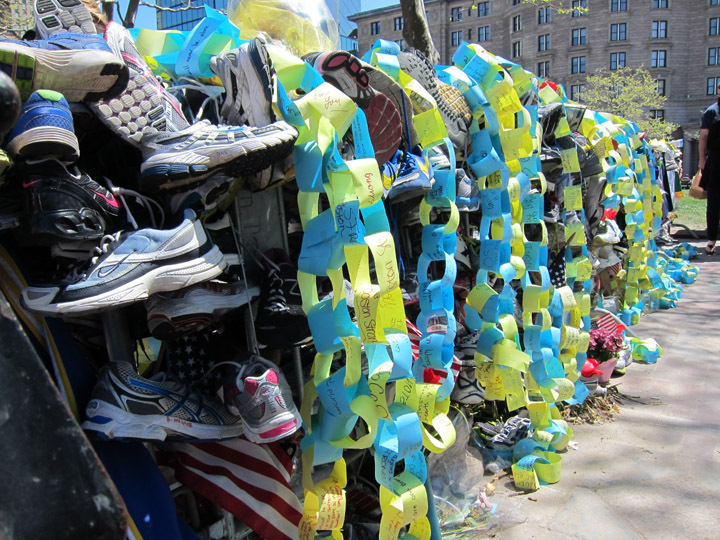 In a swell of emotion, visitors have laid whatever they could to honor those killed or injured. Nothing extravagant or permanent and nothing nearly as elegant as the permanent memorial that may follow some day. It’s a matter of what can be given quickly because the pain is acute and intense. Luckily a powerful collective comfort is found from sharing our sadness and confusion together. As if the memorial park weren’t enough, there was a group of 80 or so motorcycles that closed down Bolyston street for a few minutes on Saturday. They gathered at the Marathon finish line and proceeded to rev their engines around the first bombing site. 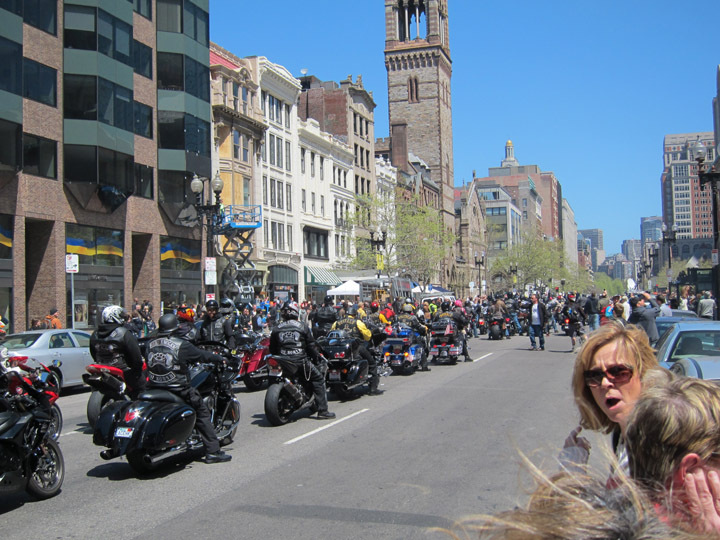 It was an incredibly loud and clearly cathartic event for the bikers. Like I said, people do whatever they can to show sympathy and togetherness in times of tragedy.